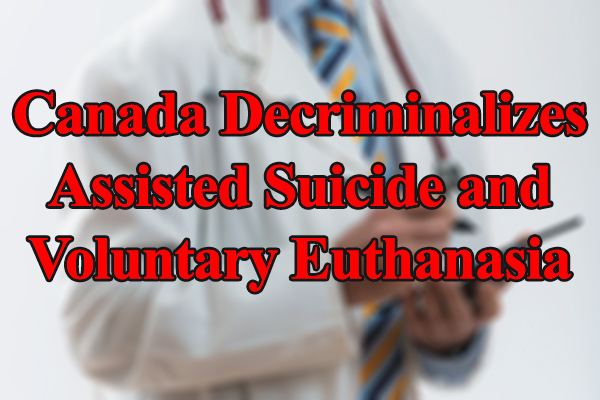 CANADA – On February 6, the Supreme Court of Canada decriminalized assisted suicide and voluntary euthanasia. The declaration has been suspended for one year to give the federal government time to propose new legislation on the issue. The news comes just under a month since Lutheran Church–Canada congregations marked Sanctity of Life Sunday. “Today Canada has crossed a threshold by opening the door to assisted-suicide and voluntary euthanasia,” President Bruce J. Clemenger of the Evangelical Fellowship of Canada (EFC) said in response to the ruling. “Our society has a long legal history of unambiguously affirming the sanctity of human life. The Court has ruled that in some circumstances the killing of a person will be legal. Euthanasia has come to Canada.” The EFC was an intervener in the case. The decision comes at a troubling time for Canadian physicians. In late 2014, the College of Physicians and Surgeons of Ontario (CPSO) released a draft human rights policy that would restrict physicians’ rights to freedom of conscience and religion. The CPSO has historically recognized the right of doctors to refuse to provide non-emergency treatment when such treatment conflicts with the physicians’ moral or religious beliefs. Such rights are guaranteed by the Canadian Charter of Rights and Freedoms. The new policy would instead force doctors to facilitate such procedures—despite their objections—by requiring them to officially refer patients to a physician willing to provide the procedure. The change would force prolife doctors to refer patients requesting abortions. And now that the Supreme Court of Canada has decriminalized assisted suicide and voluntary euthanasia, physicians would also be forced to facilitate these acts as well, despite their moral and religious beliefs. The CPSO is accepting comments on the draft policy from the public until February 20, 2015. In an earlier release, President Cliff Pyle of Lutherans for Life-Canada urged people “to visit the CPSO’s website and state their objections to the new draft policy.” A similar draft policy created by the College of Physicians and Surgeons in Saskatchewan was approved on January 16. You can contact them at communications@sps.sk.ca. The province of Quebec already requires physicians to refer. The Christian Medical and Dental Society (CMDS) of Canada has provided bulletin inserts for churches wishing to draw attention to these issues, with one specific to Saskatchewan and one specific to Ontario. Additional information is available from the CMDS website at www.cmdscanada.org. Concerned readers may also find information from the Euthanasia Prevention Coalition’s website at www.epcc.ca. 2014 was a significant year for life-issues in North America, especially on the topics of euthanasia and physician assisted suicide. In November, American assisted-suicide advocate Brittany Maynard took her own life after drawing headlines around the world on her intent to do so. In the spring of 2014, the province of Quebec passed a bill legalizing euthanasia and assisted suicide (scheduled to take effect at the end of 2015). At the same time, Lutherans have attempted to bring a pro-life perspective to the topic in a number of ways. The Canadian Lutheran highlighted the subjects of euthanasia and assisted suicide earlier in June 2014 with a feature story by Dr. L. Block entitled “Hands of Mercy.” And the 2014’s Love Life Conference, sponsored by a number of Lutheran organizations including Lutherans for Life-Canada, focused on the subject of euthanasia, with the Executive Director of the Euthanasia Prevention Coalition serving as keynote speaker. This is horrible. Sounds like Canada is taking up where Nazi Germany was stopped. I am upset by this. Shocked when I first heard the news earlier, but should I really have been? The world is being rocked to sleep like a baby while all sorts of evil entities take over. So many of my friends are happy about this and are jumping on me for stating the obvious truth in how wrong this is ~ it’s murder, plain and simple and yet others are saying they are happy as its their lives, their choices. My God, have mercy on us!! You are absolutley right our people are apathetic, including pew sitters and the general public. What is happening right now in Canada is similar to the analogy of the frog in boiling water, it does not realize what is happening until it’s cooked/dead.